We are offering Work Holding Fixtures to our clients. Under the meticulous supervision of our highly skilled professionals, we are providing a high quality range of Hydraulic Workholding Fixture. These products deliver high performance and are commonly demanded for various industrial applications. These fixtures that are used for drilling, milling and holding and can also be customized as per client's demands. Baroda Metal Stampings Engineers Pvt. Ltd.
Enriched with enormous market knowledge and experience, we are indulged in providing an inclusive assortment of Work Holding Fixture. These offered products are developed with precision by using top-notch quality factory inputs and contemporary tackles. Apart from this, we ensure to provide these products in varied models and sizes. - Atco Precision Tool Inc.
We are into manufacturing of LPG Semi Automatic Foot Ring Welding Fixture of optimum quality. Our welding fixtures carry the very good customer’s reviews and experience. They are made by constituting the most quality centric materials that are available abundantly to us. - Dependable and highly recommended. A complete range of permanent-electro magnetic system to clamp workpieces on milling, grinding, turning machines. MillTec GRIP revolutionizes the concept of magnetic clamping on milling machines and machining centers. Now you can perform a real uniform clamping, i.e. 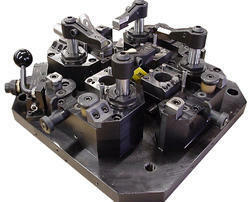 between the workpiece and the magnetic surface and in the same time between the magnetic system and the machine table.